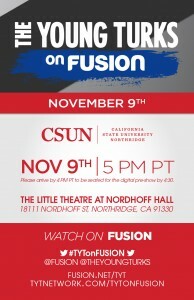 “The Young Turks on Fusion” — the weekly, hour-long live election-focused show from TYT Network and Fusion — will broadcast its post-election wrap-up from California State University, Northridge on Wednesday, Nov. 9. Hosts Ana Kasparian, a CSUN alumnus and part-time journalism lecturer, and John Iadarola of “The Young Turks” will be joined by Fusion host Nando Villa and a special guest. The show will air at 5 p.m. PST on Fusion’s cable channel and digital properties. Taking place the day after the national election, the show will focus on who is elected president of the United States and what that selection means for the nation, as well as other issues of importance to millennials. “The Young Turks on Fusion” premiered live on Sept. 12 from the University of Southern California’s Annenberg School for Communication and Journalism. Hosted by Kasparian and Iadarola and various voices from Fusion’s editorial team, “The Young Turks on Fusion” aims to discuss the most important issues facing young people this election season. From in-depth discussions on education reform and international terrorism, to game show segments and man-on-the-street Q&As about the legalization of marijuana. “The Young Turks on Fusion” engaged college students and viewers nationwide leading up to the presidential election. The producers hope to continue the discussion once the votes are in. Following the show at CSUN, “The Young Turks” will continue its nationwide tour with stops on Nov. 14 in Boston at the Harvard Institute of Politics and Nov. 21 at the University of Arizona. Through impactful journalism and smart commentary, Fusion covers the stories that matter to the new, rising American mainstream. Fusion content is available across a broad range of platforms from cableTV and Fusion.net to social media channels. Fusion is a part of the Fusion Media Group, a division of Univision Communications Inc.
Co-host Kasparian, who graduated from CSUN in 2007 with a bachelor’s degree in journalism, joined TYT as a fill-in producer that year, and quick rose through the network’s ranks to her current post. Additionally, she served as producer and contributor for the Current TV show. During her tenure, “The Young Turks” received accolades, including the 2011 People’s Voice Webby Award for Best News & Political Series as well as the 2009 Best Political News Site award. She teaches journalism at CSUN, and is also a frequent contributor on Pivot’s “Take Part Live.” This year, Kasparian was included in Forbes 30-under-30 list. Her co-host, Iadarola, is also the host and creator of “ThinkTank,” TYT Network’s second-most popular show. He also appears regularly on “What The Flick,” “The Point,” and nearly every show on the TYT network. He earned a bachelor’s in political at the University of Connecticut and left a doctoral program in government at the University of Texas at Austin to join “The Young Turks.” He also has appeared as a political commentator on HLN and Pivot TV.